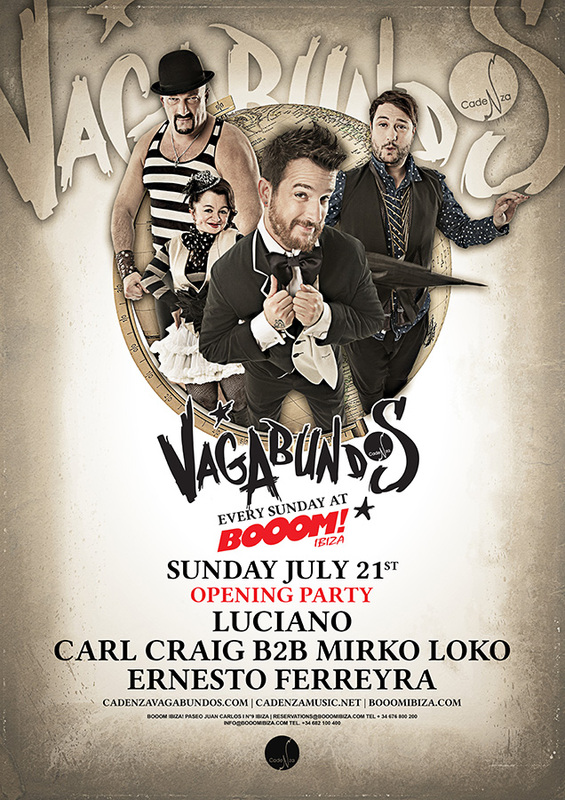 As the Ibiza season goes from strength to strength during its ‘year of change’, so too do the Vagabundos crew who start with a new adventure at Ibiza’s new club, Booom! Featuring a wealth of special guests, old and new, the next chapter in the Vagabundos story begins on Sunday 21st July with Cadenza stalwart Ernesto Ferreyra opening proceedings… Mirko Loko has teamed up with techno legend and very special guest Carl Craig for a wicked B2B set that needs to be heard to be believed, and Head-honcho Luciano closing the bill, as he only knows how. You can expect to see a whole range of special guests at the weekly Sunday parties such as Josh Wink, Derrick May, Cassius, Radioslave and Guillaume & The Coutu Dumonts, aswell as the regular Vagabundos Family Andrea Oliva, Michel Cleis, Argy, Laurent Bovey & Cesar Merveille. Putting on 12 parties throughout the season, you can expect to see new sights, new sounds, but one thing will always remain the same, and that is the true spirit of Vagabundos.